If the Good Lord's willing and the creeks don't rise, I will run the Aramco Houston Half Marathon on Sunday, January 15, 2012. As part of my commitment to do so, I’ve chosen to raise money for the Buffalo Bayou Partnership (BBP). 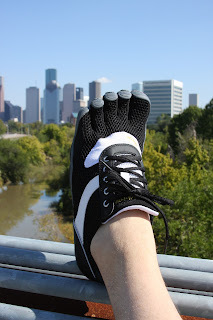 Joining the "barefoot running" craze, I intend to run the race in a sporty pair of Vibram FiveFingers, which should provide a new and different twist to training for–and finishing–the race. Next year’s Half Marathon is capped at 11,000 participants. As an alternative to the annual event’s typical entry method (lottery system), late registrants, like me, often run for a reason. This entails raising money for a charity with reserved spaces in the sold out race. BBP is one of these charities. More than $5 million in bayou improvements have been completed, including the Rosemont Footbridge and new hike and bike trail segments. The Sandy Reed Trail (Shepherd to Sabine) is being resurfaced this fall, and over $56 million in improvements will begin in June 2012. This is all good news for Houston. The Kinder Foundation, according to its website, proposed to serve as the catalyst funder with a grant of up to $30 million, an unprecedented gift to Houston's park system, for improvements to the existing 158-acre linear park extending 2.3 miles west of downtown from the Sabine Street Bridge to the Shepherd Drive Bridge. The Buffalo Bayou Park Shepherd to Sabine Project total is $56 million. Beyond the gift, Harris County Flood Control District has committed $5 million for channel restoration, and BBP is raising an additional $20 million for other improvements. I plan to raise at least $1,000, as part of an effort by the BBP to come up with that additional $20 million. While my part is nominal in comparison, every bit counts. I will gladly accept–and appreciate–your donation, no matter how small or large. You can donate by clicking here, a link that will take you to multiple giving options. On a personal note, this is a cause dear to me and my wife, Emily. We strongly support the ongoing development of Houston’s parks, believing that this work by the BBP will help to secure the city’s place among the country's best in which to live and work. For more, you can read her blog, Bettering Our Bayou Trails, where she covered this very topic. As for barefoot running, I’ve never tried it, but have owned a pair of Vibram Classics for a couple of years, kicking around in them only casually, and read the book Born to Run, which motivated me to give the method a go, despite the extra training and attention required. Great cause. Good luck Chad.